Are you planning on moving? 4. Once you have located a unit and the property owner/manager has completely filled out the paperwork, you can walk in, email or fax in the completed and signed RFTA Packet (see “Streamlined Inspections Process”). 5. Unit passes inspection – subsidy assistance start date can be effective the date the unit passes HQS Inspection, the participant has possession of the unit and the participant has fulfilled their previous lease agreement. In response to concerns of Minneapolis Rental Property Owners and in an ongoing effort to promote participation in the MPHA Housing Choice Voucher (HCV) Program, we have streamlined the process and the turn-around time to request the initial (move-in) Housing Quality Standards (HQS) Inspection. Effective July 1, 2017 MPHA will no longer require an appointment for the submission of the Request for Tenancy Approval (RFTA). Participants can now “walk in” to HCV Offices and meet with Inspection Administrative Staff to submit the completed and signed RFTA moving packet. 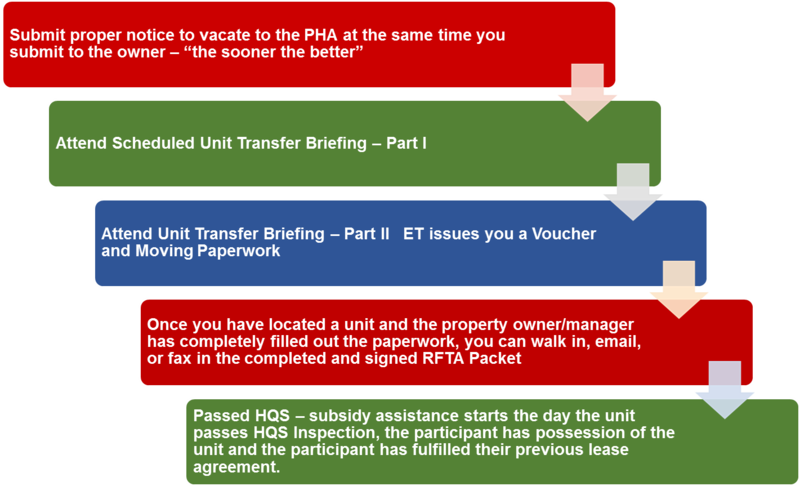 Participants or Property Owners can now submit the completed and signed RFTA Moving Packet via fax at 612-335-4427 or by email to owners@mplspha.org. Upon RFTA submission, Inspection Administrative Staff will review the RFTA (moving) packet for accuracy and completeness, including checking to see if the requested address is within our jurisdiction and a current, valid rental license is verified. The packet will be reviewed to determine whether the contract rent is within the market and meets HUD’s Rent Reasonableness criteria and that the rent is within the participant’s affordability limit. Property Owner (vendor) and unit records are created within our system, as necessary. MPHA is confident that the one line of contact and the elimination of scheduling appointments to return the paperwork and schedule the inspection will result in a timely more efficient process. Minneapolis Rental Property Owners – you spoke and MPHA listened! Effective June 1, 2017 the rental subsidy start date can be effective the date the unit passes HQS Inspection, the participant has possession of the unit and the participant has fulfilled their previous lease agreement. If you choose to port out of Minneapolis, we cannot guarantee uninterrupted assistance. Gaps in assistance are more likely if you move to another Housing Authority’s jurisdiction. Be prepared to pay your first month’s full rent. Other housing authorities have different policies from MPHA. The other housing authority may change your voucher size, which means you may be eligible for either more or fewer bedrooms than you would be in Minneapolis. Affordability will be determined by the payment standard of the housing authority you are moving to, and the unit must be affordable before paperwork can be forwarded. Please be aware that if the voucher size is changed, the unit may not be affordable once it is reviewed by the new housing authority. An inspection will be done by the housing authority where your unit is located. Housing assistance payments will not be effective until the unit has passed inspection. You will need to contact the new housing authority after MPHA has sent them the necessary paperwork. • State in writing your name, address and the date you will vacate the property and have your owner sign for receipt of the notice or Download our Vacate Notice form to make sure you have all information. • The date you leave the property must be on the last day of the month. • This notice must be given to your landlord based on your lease requirements. Your lease will state either a 30 or 60 day written notice to vacate is required. • The landlord must sign and date the notice to vacate, acknowledging when they received it from you. • If your landlord has refused to sign your proper written notice, you must mail a copy of the notice via certified mail to the landlord. You will be required to submit the certified mail receipt and a copy of addressed envelope to owner to verify the attempt to notify was made. • After you submit proper notice, you will be scheduled with the transfer briefing appointments to complete the move process and receive your moving papers. • If you do not attend your scheduled transfer briefing appointments, or fail to follow the moving procedures listed above, you may be subject to termination of assistance for failure to utilize the voucher.